Canada's Parliament, the Legislative Branch of government, consists of two parts: the House of Commons, whose members are elected; and the Senate, whose members are appointed on the Prime Minister's recommendation. 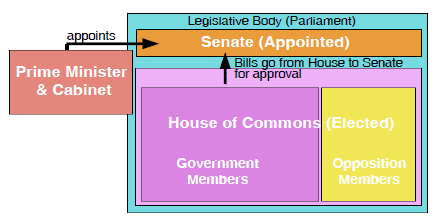 This resembles the English system where there is a Lower House, the House of Commons, and an Upper House, the House of Lords. Since the House of Commons is elected by a system of rep by pop: representation by population. Using population numbers to determine the number of representatives elected to a legislative body. "rep by pop" - representation by population - it was felt at Confederation that we needed another body to give greater representation to those provinces or regions where the population was so much smaller than the central provinces of Quebec and Ontario. The Senate was meant to provide that regional voice. 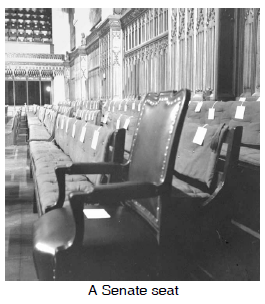 There are 105 seats in the Senate: 24 assigned to the Maritime provinces, 24 for Quebec, 24 for Ontario, 24 for the Western provinces, six from Newfoundland, and one each from the Yukon, the Northwest Territories and Nunavut. Although meant to represent the regions, the Senate is seen by many people as a patronage opportunity for governments in power, a place where they can reward their friends and allies with a comfortable sinecure. The Senate's supporters see it as a place of "sober second thought" where bills are examined carefully and improved in clarity and simplicity by a group of experienced minds. Senate reform is a recurring issue in constitutional talks and some people, particularly in the western provinces, would like to see Senate members elected from their respective provinces. Although the Senate has the power to reject any bill or insist on amendments, it seldom blocks anything passed in the House of Commons. Senators can hold office until the age of 75.